Now with a delicious hickory flavor! InflamAway ES is an economical hip and joint supplement specially formulated for dogs with Glucosamine HCl to help support healthy joints and soft tissue. InflamAway ES contains potent herbs including yucca, bosweilla and curcumin that may help reduce discomfort associated with joint problems in dogs. We have been proudly manufacturing InflamAway since 1994. Formulated without artificial ingredients or fillers, InflamAway ES contains essential ingredients needed to provide your dog with the best in joint care. Inflamaway ES is designed to be proactive and provide dogs that may be in the “Early Stages” of joint issues with an economical product for supplementation of Glucosamine. This can benefit even young dogs as they are most likely to be involved in strenuous exercise and high activity levels. Strenuous activity causes “wear and tear” on the joints and can result in the thinning and eventual destruction of cartilage. This creates a painful “bone on bone” situation which can ultimately lead to osteoarthritis. Since cartilage is very difficult to repair, it is best to prevent damage before symptoms occur. The addition of Glucosamine for dogs as a supplement is recommended by many veterinarians to help maintain joint fluids and support cartilage. 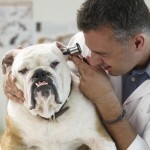 We always recommend checking with your vet to determine if it is suitable for your dog. InflamAway ES contains Glucosamine HCl, which is a natural compound found in cartilage and other connective tissues, working to control inflammation and maintain and support joint cartilage. InflamAway ES also contains yucca, a plant which is believed to be vital to joint, tendon and ligament health as it reportedly helps fight inflammation and supports the formation of strong connective joint tissue. Also included is garlic, which is widely believed to have anti-inflammatory, antibacterial and antioxidant properties, non-acidic Vitamin C which is a potent antioxidant, boswellia, which is an herb with a strong anti-inflammatory properties and curcumin, a compound derived from an Indian spice called turmeric that is commonly known as one of nature’s most potent anti-inflammatory herbs. For best results, we recommend that you use InflamAway ES with Super Oxy Green. While Glucosamine is available in two forms (hydrochloride and sulfate), we specifically use Glucosamine Hydrochloride (HCl) in InflamAway ES. We believe this form is superior, as it is more concentrated than the sulfate form and delivers on average 25 – 30% more Glucosamine for a given weight. By using InflamAway ES, you are providing your dog with a highly pure concentrated source of Glucosamine that is readily absorbed into his system. Recommend double dose for initial 4-6 week “loading” period. The InflamAway ES hip and joint formula we purchased for our dog’s problem really improved his condition. He is now able to run and play on the grass. Thanks for making a wonderful product! We started using InflamAway ES and Super Oxy Green on Dusty this summer while he was recuperating from knee surgery. I was impressed and pleased with increased energy and agility! Dusty is 13 and doing very well with these products. I have never seen such a remarkable change as in my German Shepherd dog Stacy after we started using InflamAway ES. She could hardly walk before. Now she is running and playing like a puppy. I started using InflamAway ES and Super Oxy Green when my Husky Shepherd Maggie developed arthritis at age 7. It worked! It really did! I recommended the products to all my friends. I was blessed to have my dear sweet Maggie for 17 1/2 years. Now I give 7-year-old Husky-Shepherd InflamAway ES and Super Oxy Green regularly for prevention. I’m sold. My experience has made me a believer. Are these products elixirs of longevity? I have no idea. But they help my canine family have better lives. To me that’s all that matters. Glucosamine for Dogs. Joint Supplement with Glucosamine, Yucca, Boswelia, Turmeric, Calcium Ascorbate.